LawBreakers is the new class-based shooter from Gears of War creator Cliff Bleszinski – it’s fast, ultra competitive, and quite unlike anything currently available on the multiplayer FPS market. The action takes place on Unreal Tournament-inspired maps, with two teams of five competing over simple objectives. Speed and movement are essential for attacking and stealing objectives, whereas durability and area control come in handy when your team is on the defence. Balancing the needs of the team and playing the objective are where LawBreakers’ nine distinct classes come into play. Still on the fence about CliffyB’s latest? Check out our LawBreakers PC review. Each LawBreakers class has three abilities, including an ultimate ability, and a movement ability – they also have a primary weapon with an alternate fire mode, although some LawBreakers classes, like the Titan, have a secondary weapon as well. That all equates to a lot of options in any situation, and considering the searing pace of LawBreakers’ gameplay, it’s wise to know the class that best suits the situation before barreling towards the objective. 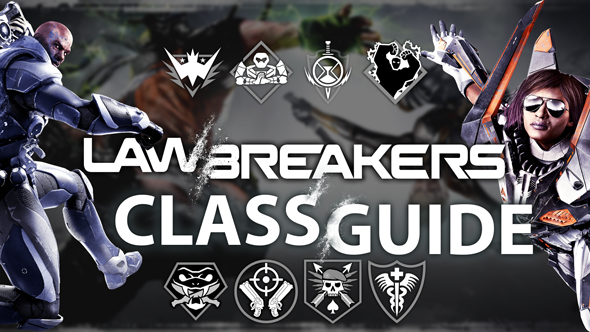 That’s why we’ve created this handy LawBreakers class guide, so you’ll know exactly how to deal with a sliding Wraith or swinging Assassin in the heat of battle. Assassin’s main weapon is a pair of machetes capable of dealing lots of damage and stealing life with each hit in close-quarters combat (CQC) situations. Its alternate fire shoots a lightning leash that you can use to swing around the map like Tarzan. Not quite close enough to your target to use those Arc Blades? Switch out to the Romerus energy shotgun, which boasts a charged shot as its alternate fire mode. A speedy strafe ability with a quick cooldown – ideal for getting around and confusing opponents. Quick-fire grenade that disperses enemies and projectiles. Assassin’s ultimate ability activates a temporary state where all enemies are revealed, during which Assassin gets higher damage and lifesteal. There’s not much room for sneaking in LawBreakers, but the Assassin is fast and mobile enough to make it from one end of the map to the other without so much as a graze to show for it. Playing Assassin is all about learning how to traverse each map as efficiently as possible. Doing so means mastering the Arc Blades’ alternate fire mode and maintaining momentum through each swing. Chain the leash and Dash together and you’ll be the fastest player on the map, allowing you to get behind enemy lines and start wreaking havoc. Assassin is also well suited to aggressive play thanks to the leech trait of the Arc Blades, which means you’re able to soak up a few hits provided you’re dealing damage at the same time. The Flux Grenade allows you to wander into a busy room and isolate single enemies to focus your flurries on. As for the Frenzy ultimate ability? It’s ideal for busy areas where the heightened lifesteal and damage can sustain an almighty killstreak. Battle Medic’s primary weapon is a grenade launcher that fires impact grenades, or bouncing grenades with its alternate fire mode. Grenade launchers struggle in tight spaces and over long distances, so Battle Medic comes packing this surprisingly deadly burst fire energy pistol. Support characters are always at their best when they have a clear view of the map, hence Battle Medic’s movement ability, which lets you hover around the map or fly to the top of the map with the use of the Hoverpack’s thrusters. Battle Medic can deploy two drones to gradually heal two teammates at the same time. Battle Medic’s ultimate ability spawns a large dome-shaped shield that heals teammates and protects them from incoming fire, while also pushing away any enemies upon deployment. The Battle Medic is a formidable support role, and excels in game modes like Uplink and Overcharge, where area control is key to winning. The reason for Battle Medic’s situational usage is the Lobber, which is adept at constant bombardments, but very poor out in the open or when tracking enemies due to the slow travel time of the grenades. Sticking to one area is also the best way to employ Battle Medic’s Support Drones as you can more easily distribute them around the team in order to ensure everyone stays alive for as long as possible. Using the Hoverpack and thrusters to travel to the top of whichever area you’re locking down will give you a better view of the action and also allows you to rain grenades down on your enemies. Battle Medic’s Defense Grid ultimate ability is perfectly suited to defensive play, but it can also be used to lock down an objective, blocking off all fire and enemy access during the crucial capture phase. Enforcer is the Soldier: 76 of LawBreakers, right down to the primary weapon – a humble assault rifle that’s devastating in the right hands. A sidearm that fires a small burst of electricity – effective up close and in a pinch. Boosts movement, rate of fire, and reload speeds for any friendlies caught in the cone of effect. An EMP grenade that temporarily halts enemies from activating their abilities. Enforcer’s ultimate readies a salvo of missiles that can home in on targets. Enforcer is LawBreakers’ most conventional class, but there’s a lot of scope for tactical plays with the Electromag Charge. Time it just right and you can use the EMP to stop enemies pouncing on the objective and making a speedy escape. For the most part, however, playing Enforcer is all about smart movement and landing hits with the Aerator assault rifle – a deadly primary in almost any scenario provided you can stay on target. Enforcer’s movement ability is essentially a sprint, but it comes with a bunch of buffs for you and any nearby teammates – while it’s active you’ll have faster movement, higher rate of fire, and quicker reload speeds. A particularly neat passive ability allows Enforcer to refuel by dealing damage, making it possible to activate Distortion Field for much longer than usual. Enforcer is useful in every situation but is best suited for racking up kills. Likewise, Enforcer’s ultimate ability is a ruthlessly efficient means of dispatch, unleashing a salvo of guided rockets – saving this for a crowded objective room is wise. Gunslinger’s primary weapon is a three-shot burst fire handgun that 3D prints its own ammo – it can be fired at the same time as Gunslinger’s secondary. Omega is a hand cannon that deals high damage. Its shot can be charged for increased damage, and there’s an added bonus of zero damage drop-off for charged shots. Snappy, short-distance teleport that’s ideal for moving around in duel scenarios. More than a simple throwing knife, the Tac-knife not only deals damage upon a direct hit, it reveals any enemies close to where the knife impacted. Gunslinger’s ultimate ability unleashes a barrage of bullets from both weapons. Gunslinger is LawBreakers’ dueling specialist and excels at dealing quick, direct damage to single targets at mid-range – this is a class for seasoned FPS players. If you’re fast and smart with your use of the Warp ability, you can duke it out with anyone, even in busy areas with multiple enemies. However, in most cases, Gunslinger is best employed in quiet areas where you’re likely to only encounter one foe at a time. Using Alpha and Omega together offers some of the highest damage-per-second (DPS) rates in the game, provided you can land nearly every hit. The caveat is that Gunslinger can’t deal any area of effect damage – climbing to the top of the match leaderboard with the Gunslinger class is all about concentrated, accurate fire. For this reason, Gunslinger suits lone-wolf players who avoid central areas and the throngs of players skirmishing for control of the objective. Instead you’ll want to pick players off from the sidelines with Omega’s charged shot alternate fire mode and dominate flanking channels. If you do find yourself outnumbered, Gunslinger’s Equalizer ultimate ability ensures you’ll never be outgunned – allowing you to fire a full-auto barrage from both pistols for a short duration. Harrier’s primary weapon is a long-range laser beam rifle that can deal constant damage. Its alternate fire mode allows you to tag enemies – both Harrier and teammates deal additional damage to tagged enemies. Laser propulsion boots that allow movement in any direction while dealing damage to anyone caught in their blast radius. Deployable health and fuel station that allows nearby teammates to recharge. Lasers are very much Harrier’s weapon of choice. Convergence channels all of Harrier’s laser capacity into one beam that deals massive damage; a fitting ultimate ability for Harrier. Harrier is a support sniper with a knack for cutting across the battlefield at a moment’s notice. The long-range damage potential of the Shoc-croc also gives you much more freedom for roaming about these central hubs than the Battle Medic class. Get caught in a pinch and need a speedy escape route? Harrier’s Raycasters ability is a two-birds-one-stone move that’ll deal heaps of damage to whoever you’re facing with the added bonus of boosting you far, far away from them. You’ll want to be close to the action as that is where Harrier’s Supercharger healing ability will see the most use. The Shoc-croc also boasts a supportive element on top of its ability to lay down a constant stream of damage: the alternate fire mode for Harrier’s primary weapon places a bullseye on a single enemy, who then recieves extra damage from all freindlies until the marker wears off. LawBreakers’ Harrier class has one weakness, however, which is that it’s not able to lay down high amounts of DPS unless your aim is perfect. One way to overcome this issue is to combo an approaching strafe of the Shoc-croc with the Raycasters, but even this won’t topple tank foes like Juggernaut, and is useless when used against a group of enemies. Harrier’s ultimate ability solves this issue by concentrating all that laser-powered attacking prowess into a single, devastating beam – ideal for sniping foes from up high or surging through crowded channels. Juggernaut’s primary weapon is a pump-action shotgun that deals a lot of damage and is effective up to medium range. Strapped to the bottom of the Instigator is a sizeable blade. Impale lets you swing that blade at an enemy and deal a huge chunk of damage. Juggernaut’s Charge is much more than a simple sprint – if you jump out of Charge you’ll spring into the air. Hit Charge once in the air and you’ll slam back down, damaging any enemies in your way. Places a temporary shield wall that can’t be traversed and deflects all damage. Suit up with extra armour that boosts your protection and rate of fire. Juggernaut can be useful in any situation, but truly excels when defending objectives on either Uplink or Overcharge. Why? Juggernaut lacks a strong movement ability but makes up for it with a ruinous array of CQC weapons, ability to soak up damage, and the Holo-deflector move that can block off entry points during lengthy reloads and team respawns. Chain all of those abilities together and Juggernaut can defend a room single-handedly for short duration of time – a Juggernaut is almost unstoppable when paired with a Battle Medic. There is no LawBreakers class better equipped for combat in tight spaces than the Juggernaut. Even against faster melee classes like Wraith and Assassin, a quick-fire combo of Juggernaut’s Instigator, Impale, and basic melee kick attack will instagib the majority of enemies. Add to that Juggernaut’s Armor Protocol ultimate ability and you’ve got one exceedingly tough nut to crack. As an attacking LawBreakers class, Juggernaut is better off using corridors and making a slow advance with a friendly for long-range support. Once again, the Holo-deflector comes in handy for controlling channels and managing the pace of combat. While Juggernaut’s Charge ability does lend a solid amount of speed to this sluggish tank, it’s worth bearing in mind that while Juggernaut is good at holding down an objective, you should avoid using this class to steal and run with it – Juggernaut is simply too slow and immobile. Titan’s primary weapon is a rocket launcher that deals both splash and direct damage. Its alternate fire mode lets you detonate rockets mid-air. Because rocket launchers can get cumbersome in CQC situations, Titan also carries Crisper, a lightning gun that deals damage to multiple enemies at once thanks to its chain effect. A charged leap that deals electrical and impact damage. Slow down enemies with this proximity mine – ideal for keeping enemies in place while you line up a perfect shot from your Hammerhead Launcher. Shoot lightning from your hands with Titan’s ultimate ability, which deals more damage than the Crisper and buffs your health as well. Titans are the tanky powerhouses of a team. They’re big and beefy with 500 health to chew through, but they’re also slow as molasses. Getting anywhere without low-gravity and the odd rocket jump is tough going, so it’s best to stick indoors where you can control an area. Titan is great at clearing out rooms and dominating channels thanks to a combination of high-damage attacks and the enemy-slowing Neutron Mine. Simply lob the mine into a busy area and use the Hammerhead Launcher, Crisper, or Pulverize to decimate any enemies caught in your trap. Titan’s Berserk ultimate ability is best activated in similar circumstances – it basically turns you into Emperor Palpatine, letting you fire lightning from your fingertips that deals huge amounts of damage and even arcs to nearby targets. The Hammerhead Launcher is highly effective when firing down at busy areas, which makes Titan reasonably adept at clearing out an enemy-held objective so that a friendly Vanguard or Assassin can swoop in and steal it back. Out in the open, Titan is practically useless, even with the alternate fire mode on the Hammerhead Launcher that allows you to detonate rockets mid-flight. The action moves too fast and unpredictably for you to land anything else than a fluke shot. Vanguard’s primary weapon is a gatling gun that gets more accurate the longer you fire. While Hydra is incredibly effective at mid-range combat it’s tough to control in close-quarters combat, that’s where Pulsar comes in – it’s a quick-fire palm thrust that displaces enemies and deals a solid amount of damage. Vanguard’s Afterburners ability is one of the most effective movement abilities in LawBreakers. This ability activates two shoulder-mounted jets that allow you to fly around the map for a short duration. A cluster of five grenades that’s effective against flying enemies and in very tight spaces. Vanguard’s ultimate ability launches you into the sky, highlights targets for you to aim at, then fires you in your chosen direction to deal damage via a ground-pound attack. Vanguard boasts a simple but flexible set of skills that all centre around Afterburners, Vanguard’s ability to jet across the map on whim. This unrivalled movement ability is ideal for capturing objectives, rushing enemies, and controlling open areas. That ability makes Vanguard one of the best classes for Blitzball, and incredibly difficult to chase down once Afterburners have been activated. The Hydra gatling gun, however, isn’t particularly well suited to the Vanguard’s movement style, which can make it difficult to balance the desire for racking up kills with the need to play the objective. That’s not to say that the Hydra isn’t useful, as the fact that it gets more accurate the longer you fire means you can use it to chip far off enemies down to low health while jetting in to finish them off with a Pulsar blast. As you’d expect, Vanguard is also effective at controlling air space – the Meteor Shells are a reliable way of dealing massive damage against mid-air foes without having to aim too carefully. Rounding off Vanguard’s toolset is the Starfall ultimate ability, which can be used to hone in on key players in busy areas, dealing heaps of damage and launching nearby enemies into the air for you to pick off with the Hydra. If there’s defending to be done, however, you’d be wise to switch to another of LawBreaker’s classes like Juggernaut or Battle Medic. Wraith boasts a full-auto machine pistol as a primary weapon. In Wraith’s other hand is Wasp, a short sword that allows Wraith to dash forward with each attack. Going forward it’s a devastating slide kick, in retreat it’s a sly evasive maneuver. Turns out that not only is the blade of the Wasp explosive, it can also be ejected – fire it at a wall and then shoot it when an enemy runs past it. Wraith’s ultimate ability allows you to shoot a beam of energy that slows down any enemies caught in its path, leaving them vulnerable to your rapid attacks. A machine pistol and an explosive knife might not sound like much, but the Wraith is an incredibly effective attacking class. In essence, Wraith is a hybrid of Assassin and Gunslinger – a class for skilled players only. In close quarters, Wraith’s high DPS potential and speedy combat movement combine to make short work of enemies. By feathering the trigger, you can also deal a decent amount of machine pistol damage to enemies over long-range, which you can significantly add to with a well-timed Stinger. You won’t be able to match the long-range effectiveness of an Enforcer or Harrier, but it’s enough to finish off weakened targets while you capture an objective. Wraith’s Chrono Switch ultimate ability makes it even easier to close the gap on distant enemies, although it’s much more effective in busy lanes where Wraith’s speed and weaponry all but guarantee a killstreak. While Wraith’s doesn’t appear to boast much in terms of movement abilities, this class has two passive movement abilities – Flip Jump and Wall Jump – that put it on par with the Assassin in terms of mobility. Flip Jump provides you with three air jumps that refresh whenever you touch the ground, while wall jump lets you navigate the map by hopping between walls. Combine the two with the speed boost offered by Slide and Wraith becomes a deadly, aerial nuisance. If you feel confident chaining those acrobatics together then you’ll also find Wraith to be pretty effective at stealing and carrying objectives. Got any essential Lawbreakers class tips that should be in our guide? Let us know in the comments below.